Non-fiction has become the center of attention in children’s literature. In part this is due to the Common Core Standards emphasis on non-fiction. Whatever your opinion is about the Common Core Standards, putting a spotlight on non-fiction has led to a plethora of books that are both informative, engaging and creative. This entices fiction lovers, like me, to give non-fiction a try and it is working. One of the ways non-fiction has changed to attract new readers is by producing a category called creative non-fiction. In this type of non-fiction book facts are woven into a story that engages students while teaching them. This has made non-fiction books more appealing to students who may not otherwise be drawn to them. Many of the non-fiction books that I recommend fall into this creative non-fiction category. 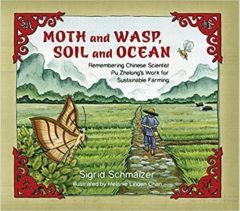 And today I am highlighting a creative non-fiction book, Moth and Wasp, Soil and Ocean: Remembering Chinese Scientist Pu Zhelong’s Work for Sustainable Farming, that can be used to teach many common themes. A book that teach across the curriculum like this one delivers a big bang for the buck. As a huge supporter of independent book publishers, I am pleased to recommend this title from independent publisher Tilbury House Publishers. Moth and Wasp, Soil and Ocean Remembering Chinese Scientist Pu Zhelong’s Work for Sustainable Farming has transformed the potentially mundane subject of protecting crops from insect pests into an absorbing book that teaches about empathy, creativity, Chinese culture and society, environmental issues and nature and the importance of science. It is based on the life and work of Chinese scientist Pu Zhelong. During the time Pu Zhelong was educated and started his career (late 1940’s – 1970’s) Chinese scientist were sent to foreign countries to get educated and were expected to return to rural areas to share their knowledge with the farmers. These scientists brought together the concepts of soil and ocean in China – soil represented local and rural, ocean represented modern and foreign. The personal stories of Pu Zhelong’s and the village farmer (a fictional composite of the many farmers who met the scientist) emphasize the importance of science. The story is narrated by the village farmer who was lucky enough to have Pu Zhelong visit his village to help the farmers control the insect population. Under the Professor’s mentor-ship, the farmer invents a tool to make this natural process easier. Inspired to become a scientist the farmer later attends college in a nearby city and then returns to his village to help his fellow farmers. The themes of protecting the environment and sustainable farming are both woven into the story. Scientist Pu Zhelong’s mission was to eliminate the use chemical pesticides which made the farmers sick and did not actually reducing the number of bugs. Using natural methods to get rid of insects harmful to the crops preserved the delicate balance of nature in the area. Readers are given a peek into the Chinese culture during the span of Pu Zhelong’s career and beyond. There are references to the Chinese government and the political changes that occurred. The narrator speaks nostalgically of the crops that were produced when he lived on the farm as young boy. We learn later that the farms were eventually replaced by clothing factories and the farmer’s family moved to the city. There are extensive end-notes that explain “The History Behind the Story” as well as additional resources to read. Lovely illustrations add to the richness of this book. Incorporated in the illustrations are Chinese characters. In the back of the book the meanings of these characters are explained as well as a brief discussion of the Chinese language. There is so much packed into this fascinating book it is hard to believe it is only thirty-two pages! I highly recommend this book as a spring board to discuss themes such as empathy; Chinese culture, society, and history; environmental issues; nature; and the importance of science. I received a free review copy of this book from Myrick Marketing & Media. Use across the curriculum to teach: History, Science, Language, Geography, Nature and Environment, and Global Cultures. Want to be notified when we add a new review to the site? Enter your information here!